I have just been feeling so frustrated with my lack of emotion lately. This has been a really tough week and you would think that I would be a complete wreck... but I'm not. Instead, I feel numb and bottled up. This is our first week living in our new house. You see, we've spent the last 6 weeks living at my parent's house. My family found us a quick rental the weekend after Vienne passed. There was no way I could go back to our home where it all happened. But, once we moved everything into the new house, I just could not move into it. I have felt that once I move here, I will be taking the first steps towards moving on...living life without her. And, that kills me. But, I eventually realized that there was never going to be "the right time" to move in. We would just have to leave the safety of my parent's house and do it. So, we did. And, it should be a really hard week for me, emotionally. Considering a bunch of other crap that has transpired this week, (Ivy's health is not well and she is not sleeping well, just to name a few) I should be falling apart. But instead, I am seeing that my way to cope through everything in my new life, is to shove any feelings I have deep down into hidden recesses where it is very difficult to dig back up. I feel like a walking zombie. Just my presence with friends makes them cry...but me? No, I just sit there, blank, feeling nothing. Somedays, lately, I will get through an entire day and look back and realize, with horror, that I barely thought about Vienne. I get up in the mornings and I put on my hard shell and plow through the day. Days are not good, days are not bad...they are just days. Last night, I stayed up late, craving to feel her...to feel anything...so sick of this numbness, this hard shell I've created to protect myself. So, I watched her memorial service video. I have only watched this twice before, and one of those times was at the service. It is one of the things that can reduce me to racking sobs. And then, of course after watching this, I realized why I make myself so numb. Why everyone else can carry their emotion for Vienne on their sleeve and why I cannot. Because my pain is sooo damn debilitating...sooo sooo deep and unbearable that there is no way I would be able to take care of Ivy if I lived in it every moment of every day...or even dwelt on it often. When I go to that place, I will dwell on sweet memories of her and then suddenly, my mind will smack myself in the face with the cold heartless truth of things...and then I will go to the place of reliving that horrible morning and filling myself with blame over and over again. I will obsess over how I could have possibly prevented it...how I could've changed things just by a different choice. "I should've stayed upstairs and changed her sheets...they needed changing that morning"..."I should've brought my breakfast smoothie upstairs to drink it there like I would on other days"..."I should've called to her when I heard her show end"..."I shouldn't have read my damn Bible!"... "I should've stayed near her body while the paramedics worked on her and I should've laid hands on her and prayer harder"..."I should've prayed harder"..."I should've demanded that they not give up!" But it's all useless. I know. And, so I must keep carrying on. I have to raise Ivy. And, to do that I have to get up in the mornings and continue a routine for her. I am a good mother and I will not dishonor Vienne by being anything less for her dear little sister. And, so I must put on my cold hard protective shell and plow through my days. I cannot sit and stare at her pictures and think too long...I have to just keep going. And, I hate it. I hate it so much. I know that I will need grief counseling - I am fully aware of that. I am scared of it, though. I am scared that they will try to "fix me"...try to make me happy again...to enjoy life eventually. And, that just makes me sick. But, I do know that I need to find a healthy balance with my emotions. I want a healthy balance. I want to feel her through the days, be able to shed some tears, but then be able to carry on. I cannot find that balance right now. It has to be one extreme or the other. Right now, I am choosing the extreme that is helping me to survive each day and be what I need to be for Ivy. But, each day that I carry on like this, I feel further and further ripped away from my beloved Vienne. At night, I keep rolling over to Mark and saying "I'm done now. I want to go home. This was a sick test and I am ready for it to be over...where is our Baby??" But, I'm not even close to done. Here is a video of just a happy memory at home, with my family. These were our typical evenings together. I want to go home. My darling daughter. My heart aches. My bones ache. My mind aches. Everything aches...at missing Vienne, at you and Mark (at all of us)having to wade through this muck and mire, at watching sweet Ivy in a new, yet unfamiliar home, surrounded by familiar toys and other things...without her sister who was her constant joy & entertainment. Does Ivy know? Does she sense VN's absence? It can feel so lonely. I've watched her face go a bit quizzical when she looks at pictures of VN. But Ivy still has joy about her...and alot of it. She caught that from her sister. What a blessing that is...for all of us. Yes, I concur. Your brave, numb, hard shell is a survival mechanism. Sometimes it feels like a blessing...sometimes a curse. It will wax and wane. Grief is as unpredictable as the sea. But the fact that you KNOW you will need some focused help to continue walking this journey (ie: counseling) and the fact that you WANT healthy balance to your emotions...tells me it will be so. It's just a blasted slow process. Realize that "today" will not be "tomorrow". It has only been 7 weeks and we are in the depths of it - and will be for some time. Navigating this wasteland takes time...excruciating, agonizing, depleting, time. But, thankfully, as you have acknowledged, you (we) have an incredible amount of support from friends, family, and oodles of people we barely know...praying, being "present", and helping to lift the weight so we don't suffocate completely. I thank God for that provision. Yes, God. I thank Him. I'm actually beginning to believe that He knows our sorrow, feels with us and is pouring out on us in the most effective way He does...through the blessings of His people. While there is much I cannot comprehend in all this concerning Him, and I really struggle to wrap my head around it and make sense of it...I cannot. Tho, I do know there is another presence that wants to dig his talons into all this, to divide & destroy whatever is remaining precious to us if we are not careful...one who relishes our feelings of hate and anger toward the ONE he hates...and we need to up our awareness of this and be on guard. I must not forget there is a battle behind all this...and at some point I must take up my sword again - even though I don't want to. It feels heavy & unfamiliar, I've forgotten how to even pick it up. But I must push myself until it becomes, once again, familiar in my heart and hand. Then it turns into a healing balm and a shelter in this storm. God knows, we need that. Mama, you write so beautifully. Thank you, always, for your words of love and wisdom and true heart-wrenching sincerity. Sweet daughter...I love you so intensly...with that same love you have for your daughters - that is how I love you and Kate. So much. On the way to the beach today, God put on my heart a sense of purpose and intent in this...to fight for you, to get down on my knees for you, for you and Mark and Ivy. To hold you up when you cannot, to pray when you cannot, to contend when you cannot, to take you before the throne of grace when you cannot, to believe for you, to hold onto the hope we surely have in Christ, when you cannot. And when the day comes that you can, I will still be there, holding on with you - you and Mark. Tom and I both, in the gap - and so many others that are praying and holding you up. I have felt so lost as to what to do...it's grueling. Nothing brings Vienne back to us physically, no. Hence the tremendous, crippling ache we feel. But what does bring me closer to her is getting closer to Jesus once again. I can approach Him, finally, with this in mind and with the purpose and intent to fight for you. This is what you would do for your children, wouldn't you my love? Your mama put it so well. I have not better words to say beyond I LOVE YOU BOTH and will continue to pray when you both cannot. love you ladies. Jules - what a beautiful writer you are. I loved this line: "Tho, I do know there is another presence that wants to dig his talons into all this, to divide & destroy whatever is remaining precious to us if we are not careful...one who relishes our feelings of hate and anger toward the ONE he hates...and we need to up our awareness of this and be on guard. I must not forget there is a battle behind all this...and at some point I must take up my sword again - even though I don't want to. It feels heavy & unfamiliar, I've forgotten how to even pick it up. " Jenny - I am praying all the time too. I read all your blog posts and they help me pray specifically for you. One day at a time sweet Sister. You are so courageous. I think you're exactly right that you're in survival mode. And I know there are so many conflicting feelings. But you are such a good mom, doing what you have to do to take care of Ivy. The thing about counseling that is great is that you learn that you never have to be "happy" or "move on." You never ever have to forget your sweet Vienne. In fact, it's quite the opposite. You learn how to incorporate her into your new normal, where you can remember her and continue to get to know her, but just in a different way. And like your Mom said, time is such a huge factor. Time does help. You are still so much in the thick of it. I'm glad to hear that about the counseling, Lexie. I guess I need to talk more with you on it. I am finding it will be hard to find just the right one. I am VERY picky. Will start serioulsy searching today. We will chat more. Although I’ve never met you or your precious Vienne (I heard your tragic news through a mutual friend), I was immediately brought to tears by your heartbreaking loss. I am also a mom and cannot imagine how difficult these times could possibly be for you and your family. But, when I stumbled upon this blog, I was introduced to your amazing daughter. I found it to be such a beautiful tribute to her memory and have followed each one of your posts ever since. And, even though we’ve never met, your beautiful Vienne has touched my life – a complete stranger – and changed it forever. In addition, you have also inspired me as a mother. As I read your posts, your love and dedication for both of your daughters shines through and it’s very clear that both Vienne & Ivy were, and are, incredibly lucky to have you. You and your family will be in my thoughts and prayers daily. Your beautiful Angel Vienne has touched so many more lives than you know, including this loving mom in Texas. I am blessed and touched to read this. Thank you so much for taking the time to share this with me. Your courageous and inspiring words are not only touching Jenny, but also touching all of us. Reading what you wrote above encouraged me so much. Although none of us can know the depth of loss and agony you all are going through, we have all been affected by Vienne's passing. My faith has never been so shaken. But, to read your words of strength and choosing to find your way back to the Father, although still devastated, moves me to follow your lead. Jenny is so blessed to have you. I love you Jenny and like we chat about often - do what you can do today. If that includes a hard shell of armor to protect your heart best you can to survive the day, do that. If you break down and feel the horrific pain, let yourself have those moments. I say it over and over that I cannot fathom your grief - but I do admire the choice you make every day to get up, take care of yourself and Ivy the best you can, and survive another day. I know. My Mama is the best. I have a child who was born a few weeks before Vienne, and I remember the "jump" phase, from the videos in your other post. We too have the videos. Such a sweet age. My God, your daughter was so beautiful. Inside and out. Even though you don't appear in the videos, it's obvious from your voice and giggles how much you loved her. I don't really know you, but it's perfectly clear that you were an amazing mom to Vienne. You ARE an AMAZING mom. I know the enemy wants to beat you over the head with this horrific tragedy, but don't listen for a second. We have all given our wee bitty children ample unsupervised time for awful, terrible things to potentially happen. You are a wonderful mom, Jenny. Just this blog and its content are evidence of that. The fact that you had reserved this blog for her, is evidence of that. 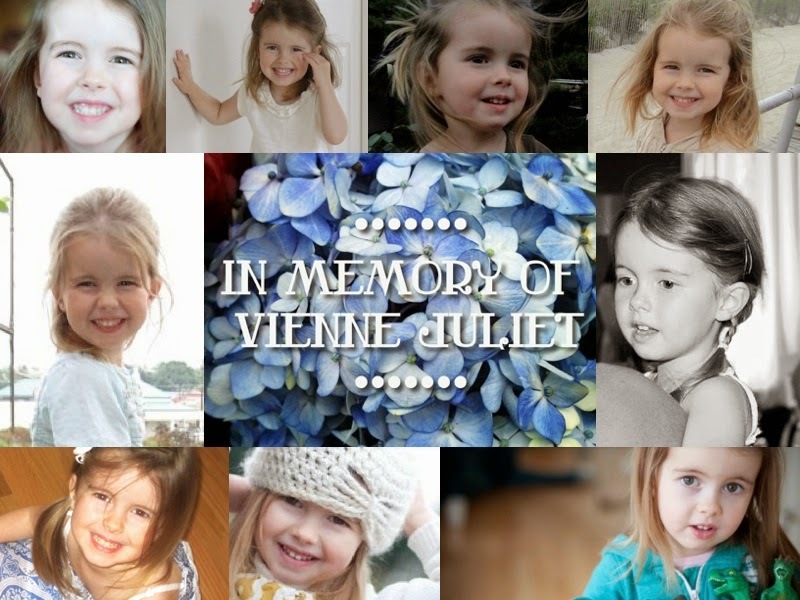 Vienne felt loved and secure every second of her life, with you. YOU ARE A AMAZING MOTHER. Thank you so much for taking the time to share your heart for our tragedy...and for your encouragement to my mothering. I need to hear these things, right now. This means so much. I know. I know, Dear Friend. I know. You speak my heart. I so appreciate your pain and constancy with me through this. I love you so much.